One of the most personal decisions in a person’s life is the nature of what happens to them once they shuffle from this mortal coil. In present times, many people choose cremation over burial, partly due to its more cost-effective nature, but also for the freedom it offers. Rather than being buried in a cemetery many miles from home, a person’s ashes can be scattered in a place they love, be it a favoured holiday location, or more simply, the place they called home. Our story today takes us back one hundred and forty years or so, yet still reflects this desire to return to the place that the subject loved – in this case, Wolverhampton. It also reflects the love to honour a partner’s wishes, no matter the obstacles encountered. We are fortunate that we are able to take many of the details of this article from an account in The Wolverhampton Chronicle in 1875 – searches of censuses help us to fill in the rest. Our subject today lived at 90, Lower Stafford Street, near to the GWR works that was Enoch’s employer. The deceased was a man named Enoch Mathews, a man who had spent much of his life in Wolverhampton, but who had spent the last few years of his relatively-short time on Earth in the United States of America. Enoch hailed from a family of agricultural labourers in Wiltshire, before moving to Wolverhampton to work at the Stafford Road Works of the Great Western Railway Company. Enoch worked as an engine fitter, at a works which were to become second only to those in Swindon. Looking up from the five-ways island, Lower Stafford Street is on the left. Enoch and Sarah lived at 90, Lower Stafford Street, near to the GWR works that was Enoch’s employer. The GWR had become a large employer, able to attract men from far and wide, having absorbed the Shrewsbury and Birmingham railway and established a small works in Wolverhampton in 1849. Enoch’s workplace would build its last locomotive in 1908, before carrying on as a repair shop until June of 1964. 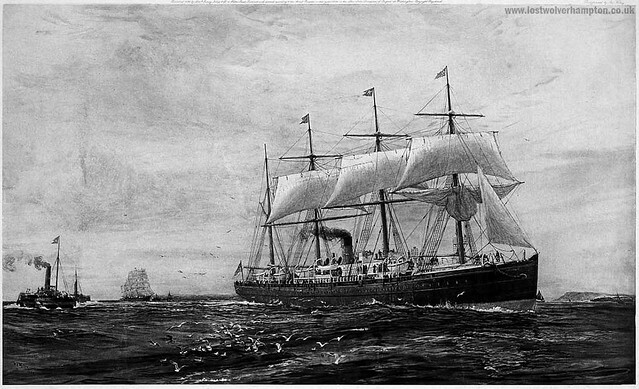 The Oceanic sailed the Liverpool to New York City route for the White Star line until 11th March 1875, when she was chartered for service in the Pacific. Enoch himself would leave the works in 1869, excited by the demands for skilled labour and higher wages emanating from the United States. Having had no children, he and his wife, Sarah, were determined to emigrate, in the hope of bettering their condition. The couple accomplished their journey across the perilous Atlantic Ocean in safety and made their way to the city of Troy, New York. The newspaper asserts that, unfortunately, Enoch, although a good workman, was in delicate health, and owing to the severity of the climate in this part of the northern United States, was unable to work at his trade sufficiently to realise the wages he had anticipated. With the assistance of his wife, Sarah, he opened a dry goods store. The buildings around 269 Broadway today still retain most of their Victorian character. 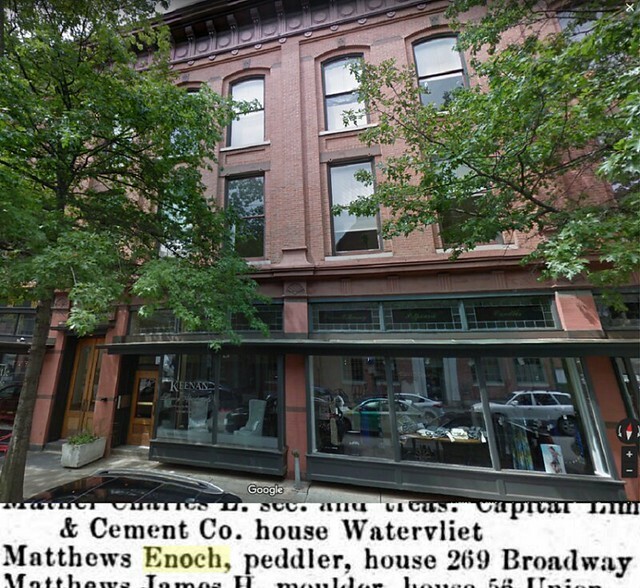 We can find an “Enoch Matthews” listed at 269 Broadway, Troy in 1874, the year of his passing. The occupation is listed as “peddler”, a curious-sounding occupation, usually given to immigrants. Peddlers would buy up surplus dry goods; grain, textiles, etc and take them to communities beyond the extent of the cities. Though the spelling of his surname is different, it is likely this is Enoch. At the time, Troy would have only had around 47,000 inhabitants, (about that of modern day Perth, Scotland) and there are no other matches for the correct (or incorrect) spelling of his name. The newspaper details that his business was successful and indeed, it carried on up to his final year, when he was seized with pulmonary tuberculosis and died on the 26th November 1874. The same harsh winter season that no doubt abetted Enoch’s demise also prevented his burial; it was frequently difficult to break up the ground for the interment of the dead in the harsh frosts of the US North West. To meet this dilemma, a series of vaults were provided in connection with burial places, where the coffined corpses were to be kept until the advent of more genial weather. In one such vault, Enoch was placed, but his grieving widow had no intention of allowing him to remain there – her desire was to honour her husband’s wish that, should he live long enough, he would see out his remaining days in the city he called home. Sarah Mathews was determined to have the body conveyed across the Atlantic for interment in England. She would face many obstacles in fulfilling this desire, with the authorities in America being unwilling to permit the removal of the corpse from their country, but her dogged persistence enabled her to prevail. After five long months of wrangling, Sarah and Enoch would return to their homeland. 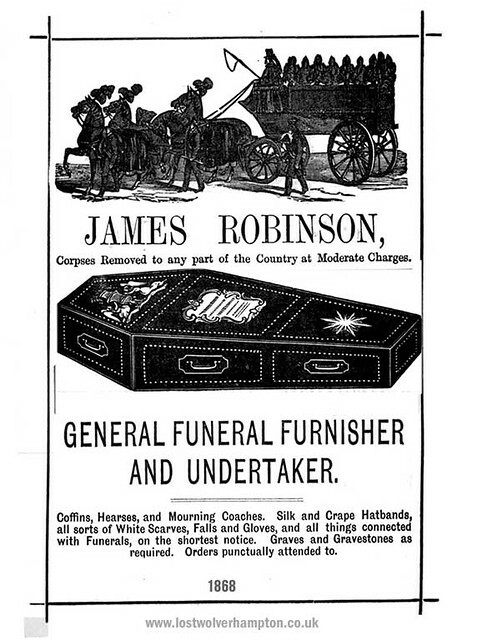 James Robinson was a typical undertaker of the time in Troy, NY. Having had no dependants to care for, Sarah could afford to spare no expense on Enoch’s death. After their dreams of growing old together were shattered, she was determined that Enoch’s final months would be a fitting display of her ever-loving affection. Although the wood of the coffin was expensive, this was almost certainly the least costly element, as the metal work was fashioned from silver and the interior lined with lead to ensure a perfectly air-tight fit. To prevent the coffin from damage, a strong packing case, lined with sheet lead, was constructed, and the coffin placed within this. The total cost of the coffin amounted to £100, the equivalent to almost £11,000 in today’s money. Enclosed in such finery, the body remained in one of the vaults or “ice-houses” mentioned previously until April of 1875, when the necessary documents authorising the removal of the body to England were obtained. The body was then conveyed by rail a distance of nearly 200 miles to New York. On the 9th, the body was placed on board a fast-sailing steam ship bound for England and was accompanied by the grieving widow. She was to be met at Wolverhampton High-Level Station by Mr Jennings, the famous undertaker of Union-Mill Street, who had been engaged to carry out the final arrangements. Jennings hearse, shown at a later date in St James’s Street. The coffin was taken to home of the brother of the deceased, The Four Ashes, at 36 Stafford Street. We can find “W Matthews” listed in the 1868 Post Office Directory of Stafforshire. 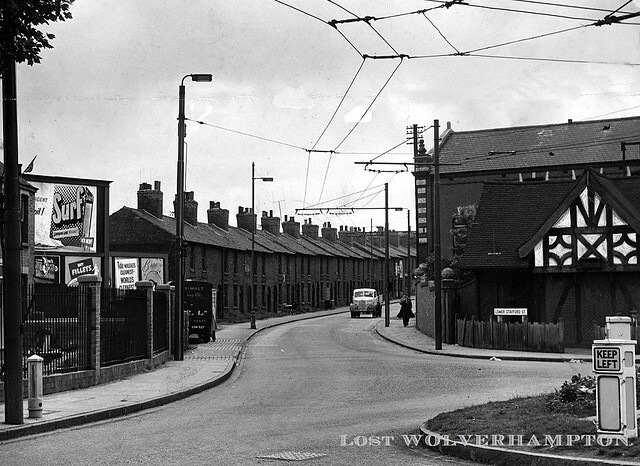 To the left we see the pub in the 1950s, at a time when Mrs Preece would have been pulling pints. It stood on the junction of Charles Street and Stafford Street. Opposite was Attwood’s Garage, roughly where Kwik-Fit would be now. Behind the garage would lie “Faulkland Patch”. 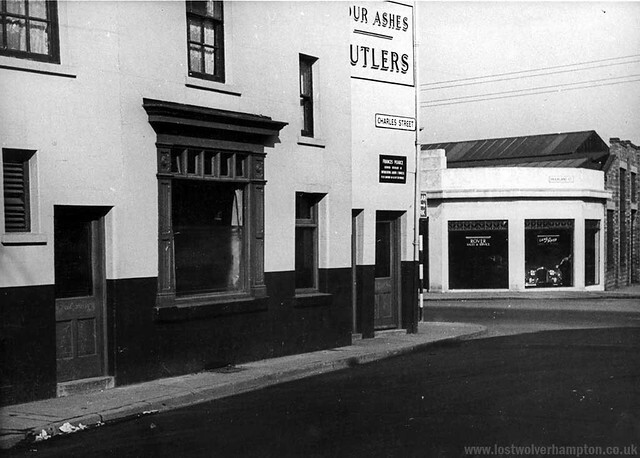 The Four Ashes, pictured shortly before its demise in the 1950s. Sarah Matthew ensured Enoch’s body was carefully embalmed and enclosed in a handsomely polished rosewood coffin, thoroughly American-made. The lid of the coffin was removed and the body of the deceased, which was fully attired in a suit of black, was found to be in an excellent state of preservation. When, the funeral took place, it attracted a concourse of at least 800 spectators. The majority of those in attendance were women and they lined the footpath on either side leading to the chapel for some time before the funeral cortege arrived. When the hearse was seen at the bottom of the steps, the officials of the Cemetery had some difficulty to keep the path clear for the coffin to be bought up. The chief mourner was the widow, and with her was the brother of the deceased and other relatives and friends. The burial service was read by the Rev, D. Williams, and after he had pronounced the usual benediction, the undertakers placed the coffin within its wooden receptacle and proceeded to nail it up. This lasted for several minutes, but Mrs. Mathews declined to leave and remained in fact until the body was lowered and the grave filled up. 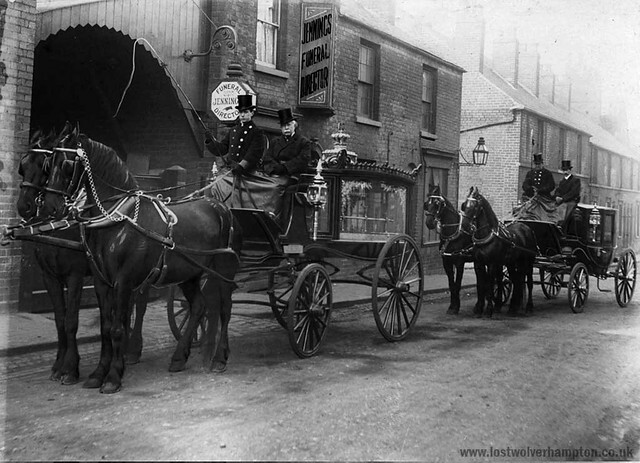 The total expense of the funeral agent was believed to have been £340, of which £100 was for the cost of the coffin and £900 was incurred in shipping the body back to England. In today’s money, this would have been the equivalent to over £38,000. 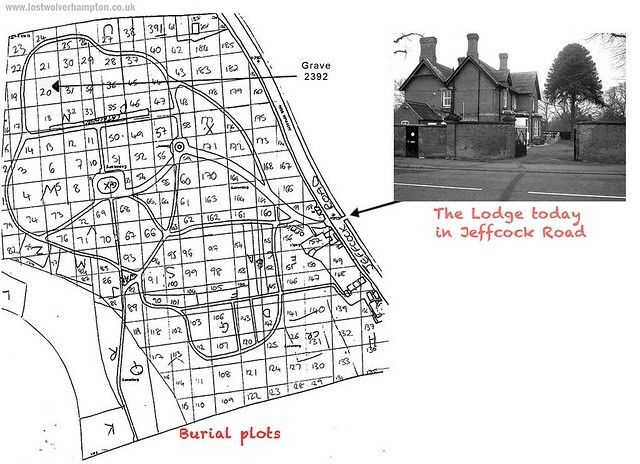 The location of Enoch’s burial plot in Merridale Cemetery. Love that old photograph of Lower Stafford street. And a great story too.